Home Article Rumored Lesbian Becky Hammon; News of having both Girlfriend Brenda Milano and Boyfriend Tony Parker. What is the actual truth? 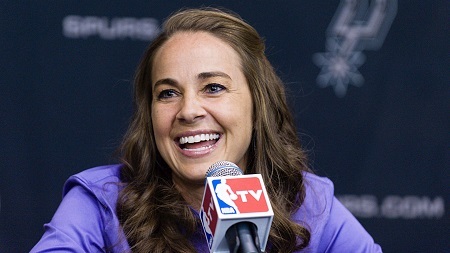 Rumored Lesbian Becky Hammon; News of having both Girlfriend Brenda Milano and Boyfriend Tony Parker. What is the actual truth? One of the controversial basketball players of the country, Becky Hammon is always questioned upon her sexuality She is rumored to be dating a female and a male at the same time. The news about her dating Brenda Milano and Tony Parker created quite a buzz. So, who is she dating these days? Is she a lesbian or just exploring her sexuality? Let us find out here!!!! The questions are always raised upon her sexuality and the news of her having an affair with Brenda added the fuel to it. Neither Becky nor Brenda has confirmed about their relationship so it might be just a buzz as well. Keeping these things in mind, Becky might not be the lesbian rather might be a bisexual as she is not only linked with females but with a male as well. In 2016, Becky was yet again in the news relating to her relationships at this time she was a man. She was rumored to be dating a Frech professional basketball player, Tony Parker. As Becky was appointed by San Antonio Spurs as a coach where Tony is playing. This might be the reason for their dating rumors. She, however, posted several pictures with Tony during the game but they have not revealed about their relationship so they might not be dating. On the other hand, Tony is a married man along with his gorgeous wife, Axelle Francine and also has a baby named, Liam. Professionally, Becky established her career as a player after joining the association called, Women's National Basketball Association in 1999. Soon she signed the contract with the New York Liberty and showed the great player spirit. Her excellent quality leads the team to the WNBA Finals and also received her first All-star selection as well. Apart from this she also appeared as a star in the National Women's Basketball League (NWBL) and won MVP Award too. In 2007, she again signed a contract along with CSKA Moscow so that to entered into the US Olympics. She gave her 100% and as a result, won a bronze medal in the Olympic for the country. Besides playing, she was also engaged in coaching as well since 2014. Moreover, in 2016, Becky became one of the first women of the NBA All-Star game to join the coaching staffs. Born to Martin and Bev Hammon on 11th March 1977 in Rapid City, South Dakota as Rebecca Lynn Hammon. Raised by her parents along with her brother, Matt Hammon, and sister, Gina Hammon. Attended Stevens High School and played basketball at the school. She was the South Dakota Miss Basketball during his junior high school. Also became the South Dakota Player of the Year while she was in senior high school. Attended Colorado State University where she led the basketball team. Started her career after joining the Women National Basketball Association in 1999. Eventually joined another league, New York Liberty and became the point guard along with Crystal Robinson and Vickie Johnson. Appeared as a Star in the National Women's Basketball League (NWBL). In 2011, she became one of the top 15 players in WNBA. Got retired from playing in 2014. Drew the announcement of NBA personnel including Billie Jean King and Kobe Bryant. Has an estimated net worth of $ 500 thousand. For more updates follow our page!!!! !